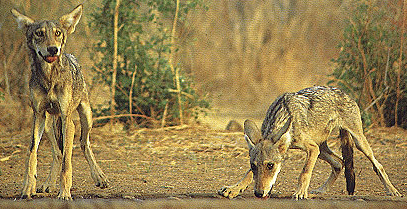 The Indian wolf is a small subspecies of wolf, and it is rather desert-adapted than cold-weather, more similar to a European Jackal than a Common Gray Wolf. The Indian wolf does not possess the thick underfur of its northerly cousins. It typically has a reddish, tawny, or buff colored coat, with little gray interspersed with it -- however, white and black markings can be found on its body; its shoulders tend to have a dark stripe over them. Indian wolves are generally smaller than European wolves, being 3 feet in length and 26 inches high at the shoulder, while the tail is 16 to 18 inches (40 - 46 cm) long. 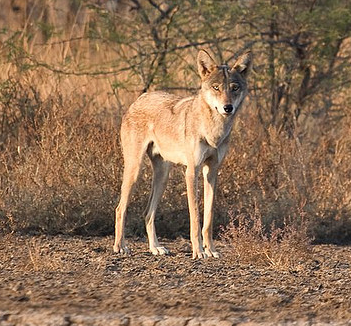 In their western range, Indian wolves can be distinguished from Arabian wolves by their larger size, darker fur, and proportionately larger heads. Some specimens may exhibit fused pads on the third and fourth toes. The frequency of these fused paw pads can be as high as 100% in India, 80-90% in the western part of the Arabian peninsula and 20% in northern Palestine. 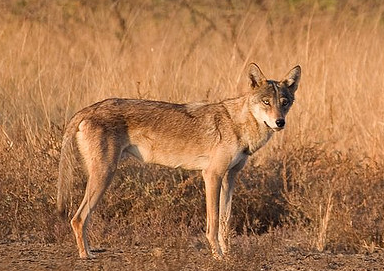 In northern Israel, Indian wolves are split into two different populations known as "Mediterranean pallipes" for those living in areas with over 15.7 inches (400 mm) of rainfall, and "Desert pallipes" for those in areas with under that amount. Specimens from the former kind of habitat tend to be the largest. The Indian wolf is technically not yet recognized as a separate species—there is debate as to whether the Indian Wolf should be considered part of the Iranian Wolf species as it always was. However, there is evidence that this particular sect of the "Iranian wolf" has not interbred with other canines in nearly 400,000 years, which could make them genetically distinct enough to be considered their own species. Indian wolves are typically lacking in the larger pack formations found in their northerly cousins; they prefer to keep to smaller, nuclear family structures. They rarely exceed more than eight animals to a pack, though they can tolerate crowding conditions in large cities quite well. Indian wolves' reproduction is not terribly different from most other large wolf species; some of the previous years' youth typically sticks around and assists the parents in raising the children, while other canines leave and seek to begin their own families immediately. The development structure of Indian wolves does not differ from the average gray wolf. Indian wolves are found throughout the Indian subcontinent, ranging from the southern ends of the Himalayan mountains down the the very tip of the peninsula. They inhabit both forests and former human cities, enjoying a relatively humanized lifestyle in some instances. Much of their food sources include antelopes, rabbits, and other small rodents. Indian wolves typically hunt in pairs when pursuing their larger prey -- during human times, Indian wolves were avid eaters of human livestock, and in some cases they continue to cultivate it. Indian wolves suffered something of a population depression in the years directly following humanity's destruction; as many populations of these wolves were heavily dependent on livestock, there was some famine and starvation as livestock populations died or were hunted to near extinction. However, Lupercism spread quickly from the Middle East and Europe, and soon these canines learned to cultivate various livestock populations -- they flourish alongside the jackal and wolf subspecies also found in their home ranges. Most Indian wolves are Luperci; however, isolated non-Luperci populations can be found in some of the more extreme regions of their range. Feral populations who are Luperci yet do not shift or engage in otherwise human behavior are still common in some of the large forests and mountainous regions of India.